One of our favourite things about weddings – the food! Luckily for us and our couples, the Chew Valley is a fantastic area for local produce and catering suppliers. Like Andy Spooner, owner of The Full Spoon, whose passion for cooking great food and sharing that love with others is contagious! Whether it’s catering for a wedding, corporate event or pop up, Andy’s attention to detail means every event is unforgettable. From travel-inspired wedding feasts to vegetarian breakfasts and Middle Eastern cuisine, Andy shares his predictions for this year’s food and drink trends and his advice on choosing the right caterer. What are your predicted wedding food trends for 2019? More and more couples are wanting to theme their food around their travel experiences. Three of our 2019 weddings have an Asian influence and this has prompted my own travels this year to help us create an authentic menu that we have experienced ourselves. We had several vegetarian wedding breakfasts in 2018 which we love doing and felt good hearing all the positive feedback from the meat eaters! We have more vegetable centric weddings in 2019 too. Ottolengi, a food hero of mine, whose middle eastern style dishes (largely vegetarian) have certainly influenced my cooking is definitely on-trend. 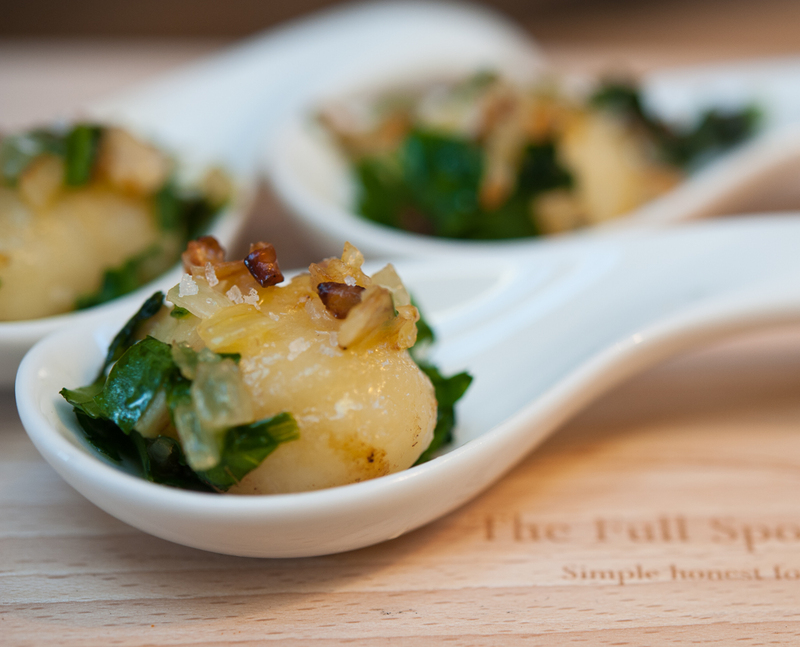 This year it’s all about healthy and delicious dishes fit for a wedding celebration. Describe the perfect wedding breakfast at Chew Valley Lake. We are so lucky to have our kitchen located close to the venue and with it access to the finest ingredients, most of which are sourced within a 15-mile radius of Lakeside. We like to get organic vegetables from The Community Farm, trout from the local lakes and venison from the Mendips. We source our meat from Luke, the venue owner and farmer. We like to give variety and offer choice so we always recommend our delicious and unique canapés for the drinks reception. When the weather is fine, we like to serve them al fresco against the stunning backdrop of Chew Valley Lake. We love a Somerset sharing platter as a starter showcasing local game and fish, farmed produce and Somerset charcuterie with breads from local artisan bakeries. Always a guest pleaser and a great way to start the wedding breakfast! 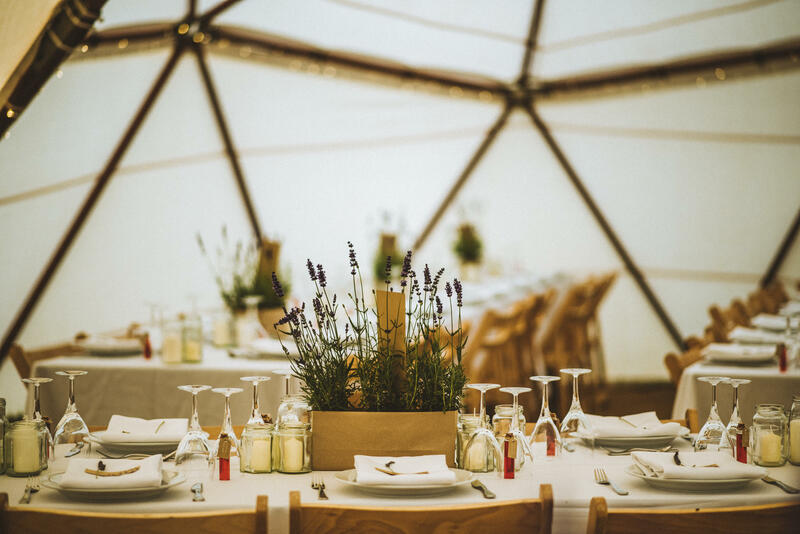 The tipis really lend themselves to relaxed, family style dining. We like to finish a meal with a plated dessert trio, usually something creamy, something chocolatey, complemented with something fruity. What should couples consider when choosing a wedding caterer? Chemistry is important. The whole experience should be fun, so being able to communicate effectively and find a caterer you can trust is important. Word of mouth recommendations and references are helpful. We also encourage couples to come to a wedding tasting which is a great way to get a sense of how we operate with the opportunity to taste our food. 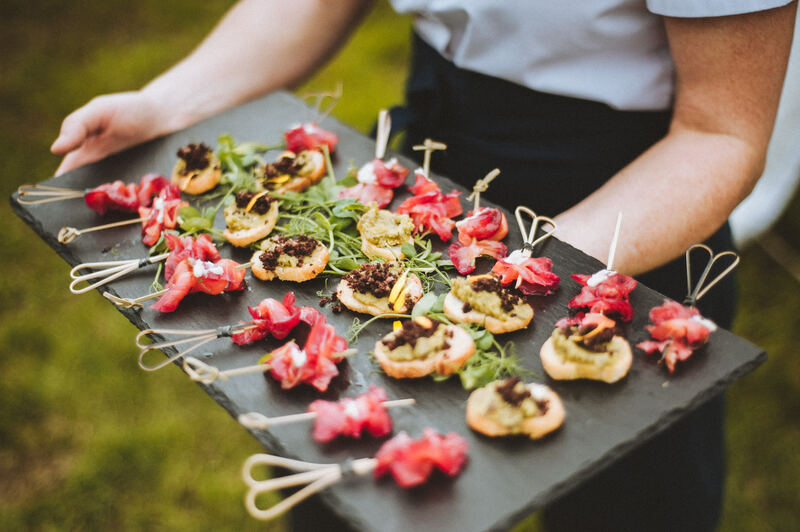 What’s the secret to being a successful wedding caterer? Being present to the needs of the bride and groom and their family too. We are there to ensure the day is perfect, so we look beyond simply delivering great food. We share and advise in the build-up to the wedding on the things that need to be considered. And on the day, we often take on the role of problem solver for the incidental things that crop up. We can be relied upon and trusted, a family friend rather than a caterer. I have been professionally cooking for 6 years, finally breaking loose from the corporate world to pursue my passion. I’ve always been a keen cook from my early years with my mum in the kitchen. Two weeks before I finished my last job I was eating at the Pony and Trap and approached Josh after a very good meal and asked if I could get some kitchen experience. I started two weeks later and worked for three months which culminated in being involved in the tapas bar at the first Queen’s Square event in Bristol. I continued to do small stints at various kitchens and learnt some butchery. Other than that, I’m largely self-taught and always ready learn from my chefs! From the heart, and with love. The plate should look good, but it’s more about substance, flavours and textures, letting the ingredients do the talking rather than a ‘chef’s plate’. Simple honest food served family style with sharing platters to encourage connection and conversation. There are many things that have Influenced my cooking style; my family and our shared love of cooking and eating, travel, food heroes, what’s in season – they all draw me to create. I don’t have one ingredient! If I’m off exploring, hiking, sailing or camping I will always have olive oil, garlic, Maldon sea salt and cracked black pepper in my bag. Beyond that I will create from what is available and am happy to substituting when something is missing. What’s your most interesting or fun experience from your time catering at weddings? Food and creating the eating experience is our thing. We love it when the bride and groom are foodies and want the food to be a big part of their wedding celebration. We love to explore with couples. Finding out about their favourite dining experience has meant meeting in restaurants to experience and taste the dishes they want to include in their menus. We then recreate and develop menus that are truly unique. 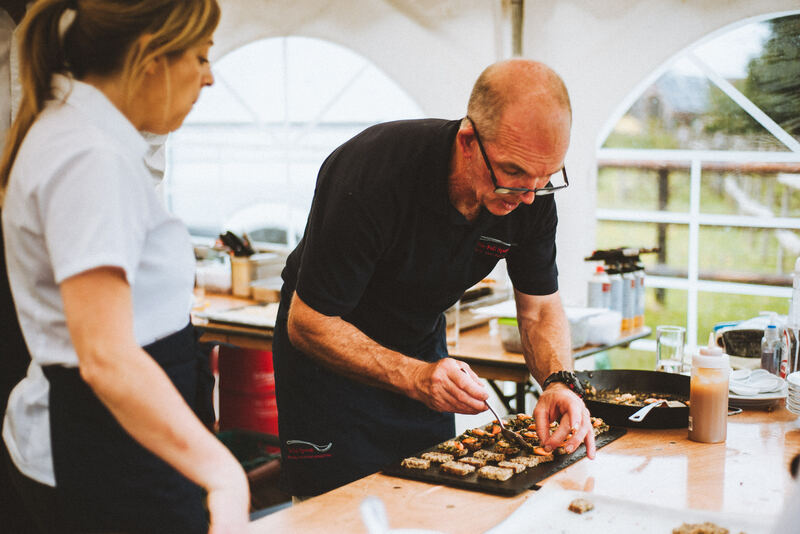 We have the most fun on the day when guests can see and get connected to the team creating the food, and share the experience whether it’s engaging with guests or the spectacle of open fire cooking. If on the day, there is something in season that is particularly good that would make a canapé or dish memorable, we will bring it to the table. To talk to Andy and his team about your special day contact via email; info@thefullspoon.co.uk or call 07970 167 037. For more information visit www.thefullspoon.co.uk.